in Tameside region east of Manchester, U. K.
Upper left corner, the larger red circle is Manchester, England, a city of half a million residents. 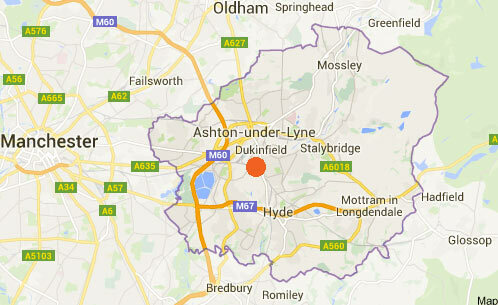 The smaller red circle is Dukinfield, a town of about 20,000 people on the south bank of the River Tame opposite Ashton-under-Lyne on the north bank. On July 4th, 2016, an 18-month-old female cat named Socks was found dead with her head and tail cleanly severed from her body. 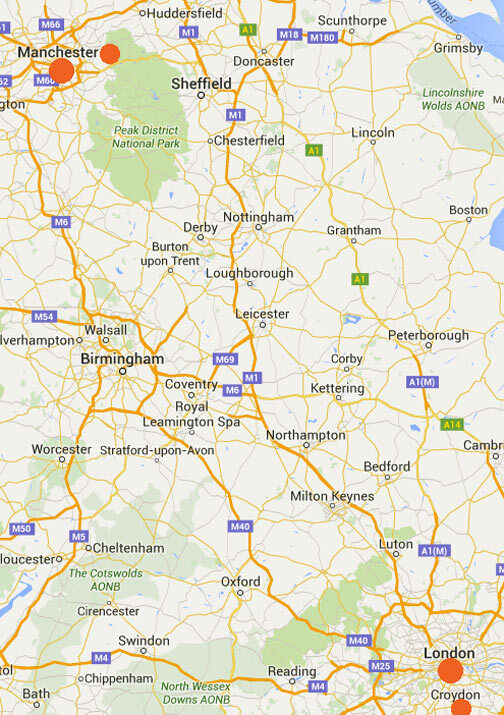 208 miles to the southeast in the lower right corner, the larger red circle is London and the smaller red circle is Croydon, 12 miles south and the center of half-cat mutilations since January 2014. July 9, 2016 Tameside region east of Manchester, England - Dukinfield is a town in Tameside, Greater Manchester, England, on the south bank of the River Tame opposite Ashton-under-Lyne, 6.3 miles (10.1 km) east of Manchester. The 2011 Census population was 19,306. The Tameside region's history goes back 10,000 years to twenty-two ancient sites where humans lived. Today, Dukinfield Park is making news as the place where primary school teacher Claire Collins found her 18-month-old female cat, Socks, at 7:45 AM on Monday, July 4, 2016, in the park near King Street. Her head and tail had been cleanly severed from her body and skin had been removed from her left hind leg.